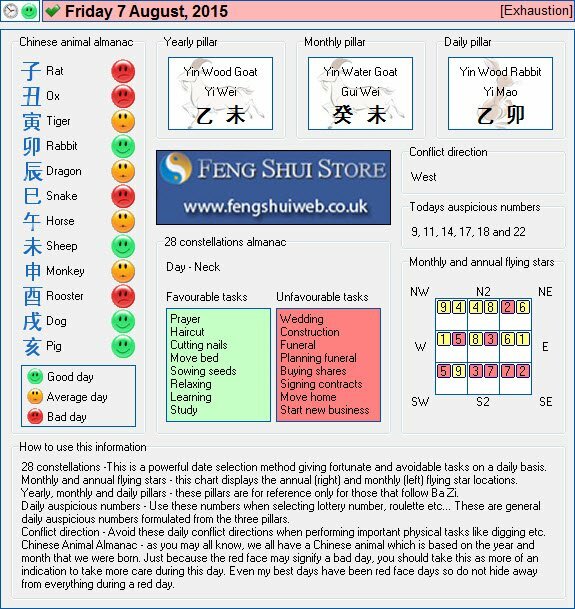 Here is the Free Feng Shui Tong Shu Almanac for Friday 7th August 2015. I am the kind of person that feels better if applying some kind of cure. Is there any cure I can place even if it is small in my bedroom area? By the way I just found out today through an email from your website that I can ask my question in the Frequently Asked Questions. I just could not find it myself in your website. I would place either Six Chinese I-Ching Coins in a row or a Brass Wu Lou. Metal and fire are the best cures here. I have combination [3,2] bull fighting sha with base #7 star located in my West sector which is mostly my tiny bathroom and a very small portion of my bedroom (about a 3×3 area). What would be the best cure to take care of this affliction? The fact that the majority of this combination is in your bathroom is very good as this area is usually kept quiet and is not used as often. I would avoid having a television or stereo in the area of your bedroom with the bull fight sha if possible.